In one more week it will be August and we still haven’t had summer here in Manhattan Beach. Today the high was 69 degrees F. I am hopeful that warm weather is right around the corner, so in anticipation, here is a cold Soba Noodle Salad that will be great to enjoy outdoors when the sun is shining and palm trees are waving in the warm ocean breezes. It’s going to happen, right? I love the peanut butter dressing that goes on this salad. It has every taste sensation possible: sweet, sour, salty, bitter and umami. Then there are the soft noodles, and the crunchy cucumbers, bell peppers, carrots and peanuts. It has the whole sensory board covered: looks great, smells sensational (especially the sesame oil and ginger), feels soft and crunchy, sounds enticing with the slurping of noodles and crunchy veggies. Come on sun, where are you? Soba is made with buckwheat flour. Buckwheat is a grain-like crop, but is not a cereal or grass, and has no gluten. It’s called a pseudocereal to emphasize it is not related to wheat. Common buckwheat was domesticated and first cultivated in inland southeast Asia around 6000 B.C., and spread to Central Asia and Tibet, then to the Middle East and Europe. The fruit is an achene, similar to sunflower seeds, with a single seed inside a hard outer shell. The starchy endosperm is white and the seed coat is green or tan, which darkens the buckwheat flour. The hull is dark brown or black and some may be included in the flour as dark specks. Buckwheat noodles play a major role in the cuisine of Japan (soba), Korea (naengmyeon) and the Valtellina region of Northern Italy (pizzoccheri, a flat ribbon pasta). The difficulty of making noodles from flour that has no gluten has resulted in a traditional art developed around their manufacture by hand. This Soba Noodle Salad can be eaten at room temperature, cold, warm or the leftovers stir fried. The next photo shows how I ate them cold the second day with tomatoes, avocado and sliced green onions added. It was really wonderful! 1. Cook noodles in boiling salted water according to package directions. Drain and rinse under sold running water. 2. Puree peanut butter, vinegar, maple syrup, soy sauce, fish sauce, ginger, garlic, lime zest, lime juice, sesame oil, brown sugar and ¼ cup cilantro in mini food processor until smooth and creamy. 3. 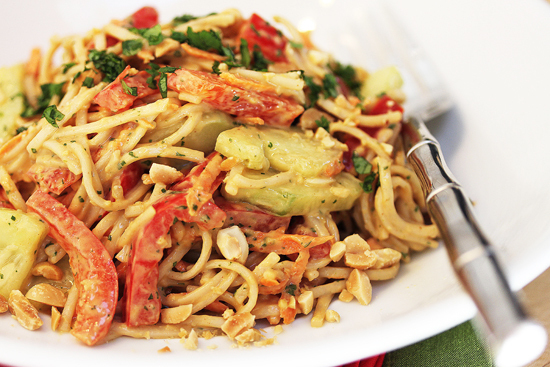 Toss together noodles, cucumber, bell pepper, carrot and peanut butter mixture. Garnish with remaining cilantro and chopped peanuts. I love all the background information you give on your recipes. It has been relatively cool here in Colorado this summer, which is a blessing I guess! I think that peanut sauces are some of the best out there. Such a wonderful melding of flavors! As a serious peanut butter addict, I have to say I will be needing to try this. Imminently. The way you described the dressing makes me want to eat it for breakfast, lunch, and dinner. Just recently, I’ve taken on a strong liking to soba noodles and have been using it more often. I’m coming back for this recipe as I know it will be a hit for me and Hubby. 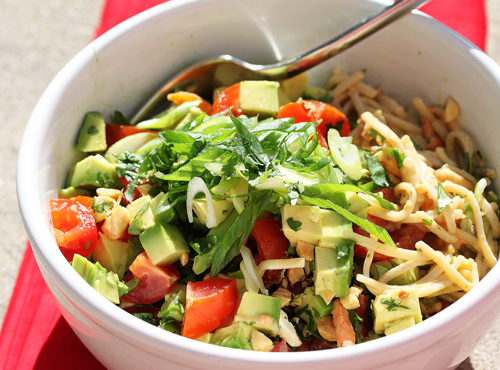 I like your additions of the tomatoes and avocados! I can’t get enough Soba noodles and this recipe looks terrific and incredibly refreshing for the summer! I’m definitely making this next week. Gah! I go nuts for peanut sauces. This one looks fantastic. I usually eat peanut sauces with raw broccoli and of course Thai food. I gotta get this recipe in rotation ASAP! I am salivating over this. I like the addition of the avocado, too. More creamy goodness on top of more creamy wonderfulness. This sounds fantastic with all of the different textures…and of course peanut butter. I’m right there with you on this less than stellar summer. If/when the sun does finally come out, I am going to be buried in tomatoes. Oh, I’m just crazy about peanuts sauce/dressing as well! Anytime I make it, I double the batch so I can find creative things to do with it later. This is such a vibrant dish–will try! I didn’t know they were gluten-free either and love the sound of that maple syrup. Nicely written post! This looks yummy! I am going to try it with wholewheat spaghetti. Not a soba fan!! Yumm! This is perfect! My friend has a bunch of soba noodles almost past expiry date, and she’s been asking me how to use it. I’ll be sure to send her an email with a link to this post! Like others I didn’t know soba were gluten-free. Good to know, so I have more options when my GF eating friends come to dinner. I’m not a maple syrup fan despite my many, many attempts to join the ranks of fans – I’ll just use agave or honey, unless you recommend something else. Andrea ~ You can certainly use agave or honey, or just leave out the maple syrup and see how sweet it is. Maybe it will be sweet enough for you without adding anything. Or you could add more brown sugar. Because the buckwheat flour has no gluten, the soba is frequently made with some wheat flour (maybe 80:20), which is what my package was. I wasn’t able to find 100% buckwheat soba in my area.